During the 1960s, Kawasaki, with a background in two-stroke motorcycles, began developing a 750 cc, four-cylinder, four-stroke machine; that is, until Honda spoiled the fun by unveiling the CB750. Back at the drawing boards, Kawasaki’s engineers increased displacement to 903 cc and finally in 1972, the world’s fastest production motorcycle – the Kawasaki Z1 900 – was born. Since then, nobody has held the world’s fastest title more often than Kawasaki, with machines popping up every few years throughout the 1980s, ’90s, ’00s and ’10s to regain the crown from other manufacturers. Even today, Kawasaki holds the title with the 300 hp Ninja H2R super bike. The extra “RS” in the name means an extra $4,000 or so. By 1981, the Italians (by way of Ducati and Laverda) were scrapping over the who’s-fastest card, but Kawasaki was busy using a tried and true version of its Universal Japanese Motorcycle to clean up the AMA Superbike championship with Eddie Lawson in the saddle. The street version of that machine – the KZ1000J – was growing a little long in the tooth as two-wheeled performance headed toward liquid cooling and single-shock rear suspensions, neither of which the Kawi had. In a bit of an act of marketing prowess (or desperation), the Eddie Lawson Replica KZ1000R emerged from the J-platform, but with racier brakes, bars, pegs and exhaust. Plus, it was painted lime green like Eddie’s actual race bike (though instead of the black stripe, it wore blue and white ones). The original 1972 Z1 900. Eddie Lawson with his Kawasaki’s replica, back in the day. Today, the Eddie Lawson Replicas remain exceedingly sought-after collectibles, based on their racing pedigree and the Z1’s significance to performance motorcycling development in the ’70s. What’s this new bike like then? 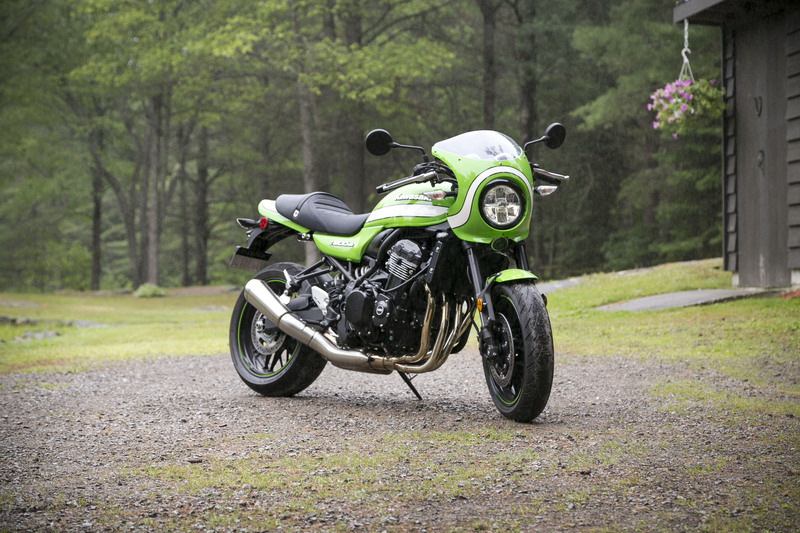 As it happens, it’s not just ardent motorcycle collectors who appreciate Kawasaki’s remarkable reign 40-or-so years ago, for the number of guys in their 50s-and-up who stopped, mouth-agape, or bee-lined toward my Heritage Lime Green test bike, show the new homage has hit all the right styling cues. Are those scuff marks on the side of the rear tire? Good for Jeff! The Z900RS Café differs from other RS trims (also new for 2018) with its bubble-shaped fairing, scooped seat (like the EL Replicas) and a lower handlebar set. 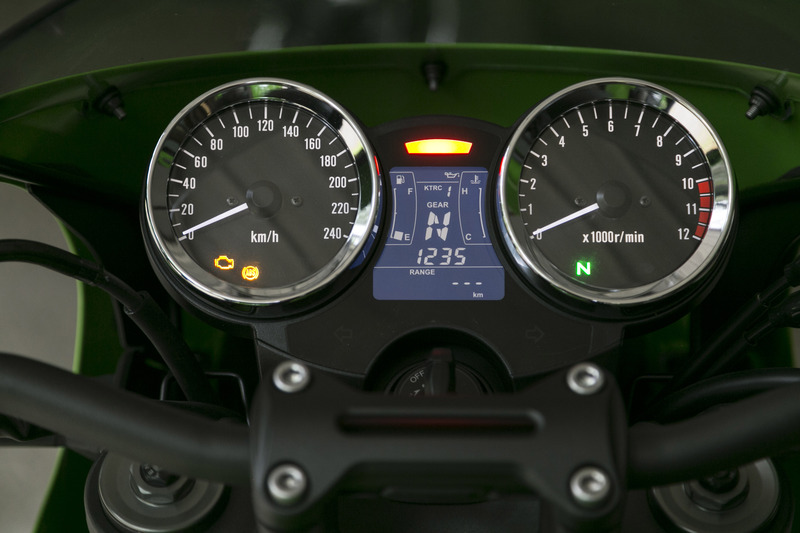 There are other, more subtle differences too, like the chrome trim that’s been blacked out, the Z900RS name plate visible through the windscreen in front of the gauges, and a brushed-finish to the exhaust can. An even keener eye will spot the Café-exclusive DOHC badge on either side of the engine. Kawasaki has developed a habit of pricing its lime green editions at a premium over those painted in other hues and the Z900RS Café is no exception. Ringing in at $13,599, the Café costs $400 more than the Special Edition (which, itself costs $200 more than the standard, black RS). Since the fairing and windscreen, plus the lower bars and unique seat are thrown in too, the added cost is easier to justify. The RS line-up itself started life as Kawasaki’s super naked, the Z900 – a bike that’s received considerable acclaim, including my own, but is nearly four-grand cheaper. I’d love to tell you that the extra money has gone into superior materials or more kit, but all I can come up with is that the RS has an LED headlight and traction control that the Z900 does not. Still, the Z900RS Café undercuts the Triumph Thruxton and BMW RnineT by a fair margin, and will turn just as many heads. 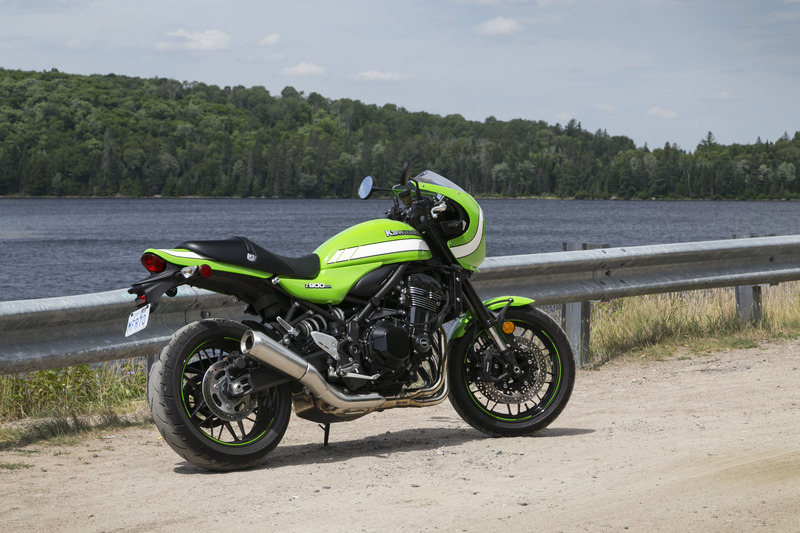 The retro-styled Z900RS is much more than just a Z900 restyling exercise. The frame is modified to accommodate the longer tank, higher front-end and lower rear-end. The engine, too, is significantly modified, by being re-tuned for livelier around-town performance at the expense of some top-end wail. 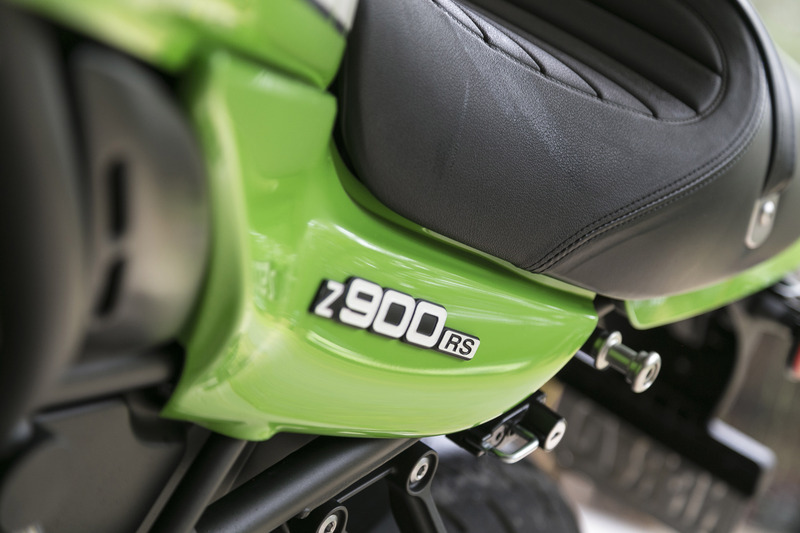 Peak power dips from 125 in the Z900 to 111 hp in the Z900RS in the interest of giving the new, old-looking bike an easier personality for daily riding. Kawasaki also took great pains to tune the exhaust sound, giving it a thoroughly pleasing thrum at idle, and a snarl when ripping up through the revs. All of that seems fine for the RS, but the Café is supposed to have a sportier persona that’s more raw-and-ready, and I would’ve loved to have heard more of the Z900’s wail (and felt more of its top-end urgency). Hell, while I’m making demands, let’s throw on a Kerker or Hindle megaphone to help too, shall we? This isn’t to say the Café is slow or unexciting. This is, after all, still a bike with more than 100 hp that weighs in at only 214 kg. It’s just that the Z900 can raise the hairs on my neck, and I don’t think that sort of reaction would be out of place on the Café model. The 948 cc inline-4 impresses for its turbine-like smoothness. The bars are rubber mounted, and the pegs have rubber tops to them too, but my God, this thing hums along with such fluidity that even after a multi-hour highway dash, there were no tingly fingers or toes. That said, I recall some butter-like fueling from last year’s Z900 test, and yet this bike seemed abrupt with the throttle off-idle, making shifts – particularly from first-to-second – challenging to smooth out. At first, it seemed like maybe I just needed to get used to the new slipper clutch that Kawi’s added to the RS line-up, but downshifts showed no issue, making me pay more attention to my throttle inputs on upshifts. Thinking it may be just this one particular bike, I also spent some time on a Z900RS SE and found the same sensation. Fairing, or no fairing? 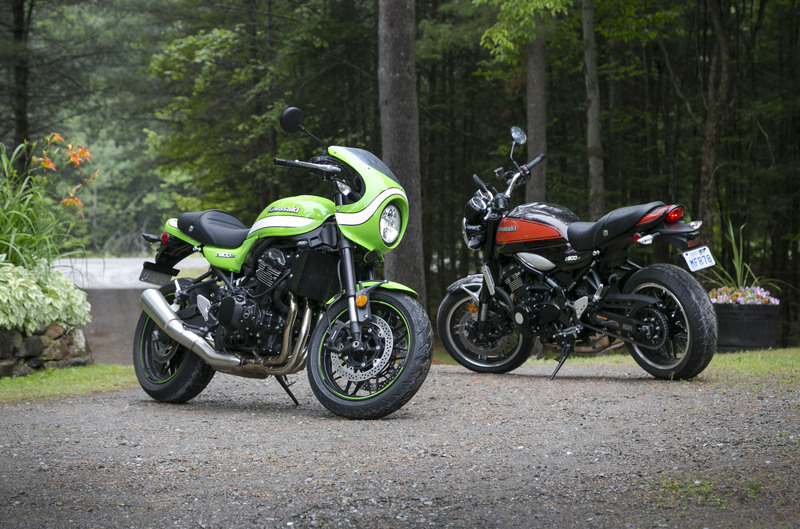 Kawasaki has something for everyone with the Z900RS Cafe and the Z900 RS SE. Not only does this new bike have more power and torque, as well as less mass, than the championship-winning superbike it resembles, it out-handles the old machine thanks to modern rubber and suspension technology. During one of my fuel stops with the Café, an old-timer regaled me with tales of how fast and powerful his old Kawi was, but how its handling was diabolical. Kawasaki frames were rumoured then to be hinged in the middle. On this new bike, the front is suspended by a 41-mm inverted fork, while the back has Kawasaki’s Horizontal Back-link. Both ends are adjustable for each preload and rebound. I left everything set to factory spec and found it a great set up for absorbing the frost-heaved and pock-marked roads, but without taking all the starch out during some fun cornering duties. Compared to the Z900, the RS bikes have a half-degree less rake and slightly less trail, and a wheelbase stretched about another couple of centimetres. This produces lighter, more eager turn-in response to the steering, but also helps the RS / Café maintain stability at speed. The effect is an easy bike to ride around town. Braking is handled by twin 300 mm discs, clamped by radial-mount, 4-piston calipers up front, with a single 250 mm rear disc (single-piston caliper). Brake feel is strong and progressive, and seems well-matched for the bike. 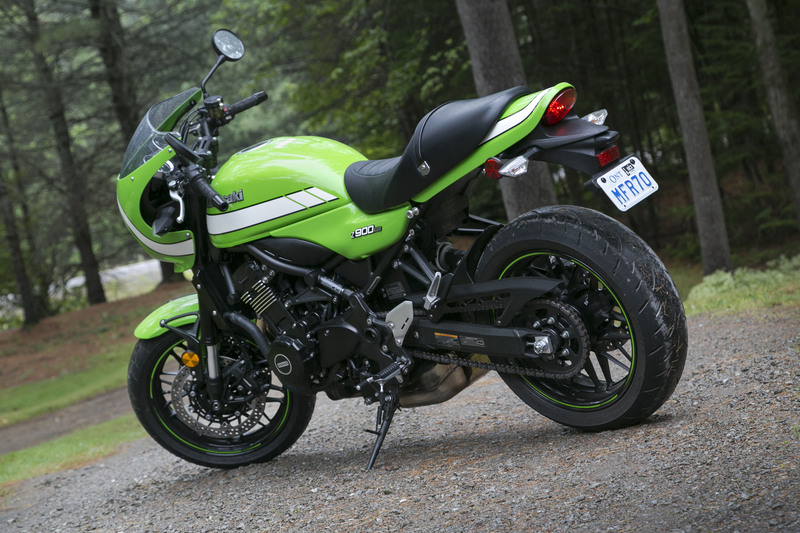 Kawasaki has made ABS and its multi-stage Traction Control system standard on the RS line. No scuff marks on this rear tire. Must have been at the start of the day. Is it any good out in the country? The Café is also comfortable enough to do light touring duties. I used it for commuting through traffic and around town during the week, then headed north to ride Ontario’s Highlands on the weekend, clocking in more than 1,500 kilometres. The 17-litre fuel tank afforded an average range of 320-340 kms during moderate backroad duty, while stop-and-go urban riding or high-speed freeway distances understandably increased consumption rates. The fuel gauge is comically non-linear showing a full, or nearly-full tank for the first 100-or-so kms before dropping rapidly, and then flashing its warning with a good 90-or so kms to go before empty. A bit of retro in those round dials, a bit of modern in the centre screen. And a gas gauge gone rogue. As well-sorted as the Z900RS Café is as a sometimes-tourer, and sometimes back-road carver, there are plenty of other machines that do either task better than this bike. But none look the way the Café does, and that’s what makes this machine such a brilliant success at its mission. From the twin-dial gauge pod, to the duckbill fender treatment, to the stylized, superficial cooling fins, it’s the sum of countless, thoughtful details that combine to provoke a strong emotional response from victims of nostalgia and those too young to remember the original Kawasakis. It’s a bike that will have its rider looking at it over his or her shoulder every time it’s parked. But best of all, it’s a bike that outperforms the inspirational legends with fun, reliable and accessible performance, and which is deserving of its celebrated livery. Time to fire ‘er up and head home, but first, one more lap around the park, for Eddie. Apparently, this bike won’t be a permanent fixture in Kawi’s line-up. It’s pricey to buy and not cheap to insure, otherwise I’m sure all of them would be sold already based on the looks. It really is a shame and a sham as to how unreasonably expensive motorcycle insurance rates are in Canada. The rates in the USA are considerably less, and I pay a flat $300 per year 100K 3rd party, or $ 550 per year comprehensive for motorcycles less than $20k value regardless of brand/type of motorcycle. Yes, I’m over the age of 25, and I can ride year round – I live in the Tropics and I am a Canadian citizen. Amazing. Sorry, I worded that poorly. The RS, at 25-degrees has a half-degree less rake (which, in my mind at the time translated to bringing the bars a little more upright and a “couple of cms-longer”). The RS has 5 mm less trail (98 mm vs 103 mm). “Kawasaki holds the title with the 300 hp Ninja H2R super bike” – A production bike? Holy cow! This is a nice bike though, I like it almost as much as a 2003 Eddie Lawson Replica, and that’s a lot of like! Pass onto Kawi the idea of a retro sport bike please. I passed one the other day in Campbell River and, I must say, it did catch more than a glance from me. Very cool bike, good work Kawasaki !